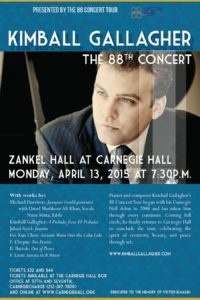 88 International was born and nurtured around the world during Kimball Gallagher’s, ground-breaking 88 Concert Tour, which began in Carnegie Hall in 2008. The tour brought Kimball to all seven continents, touching the hearts of thousands of people with his extraordinary vision, music and playing. The concerts were so successful, that the tour grew from a projected 88 performances to over 325 concerts throughout the world. Coming full circle, this gifted and passionate ambassador of the arts and humanities returned to Carnegie Hall on April 13, 2015 to conclude his tour performing masterworks of Chopin, Liszt, as well as his own Preludes, a kind of travelogue in sound. The final concert was reflective of Gallagher’s reach through out the world, from India to Peru, from Taiwan to Tibet, from New York to New Mexico… A true celebration of the spirit of creativity, beauty and peace through art. 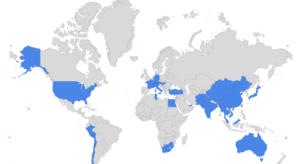 The 88 Concert Tour took Gallagher to a total of 30 countries: Afghanistan, Antarctica, Australia, Austria, Chile, China, Egypt, Fiji, France, Germany, Hungary, India, Italy, Japan, Lebanon, Malaysia, Mongolia, Myanmar, Pakistan, Peru, Singapore, South Africa, Switzerland. Taiwan, Thailand, Tunisia, Turkey, UAE, USA and Vietnam.